Happy 4th of July! Today marks eight years since Paco and I got together. He asked me to forsake all other anniversary celebrations in favor of our wedding anniversary, so I will not wish him a happy anniversary. 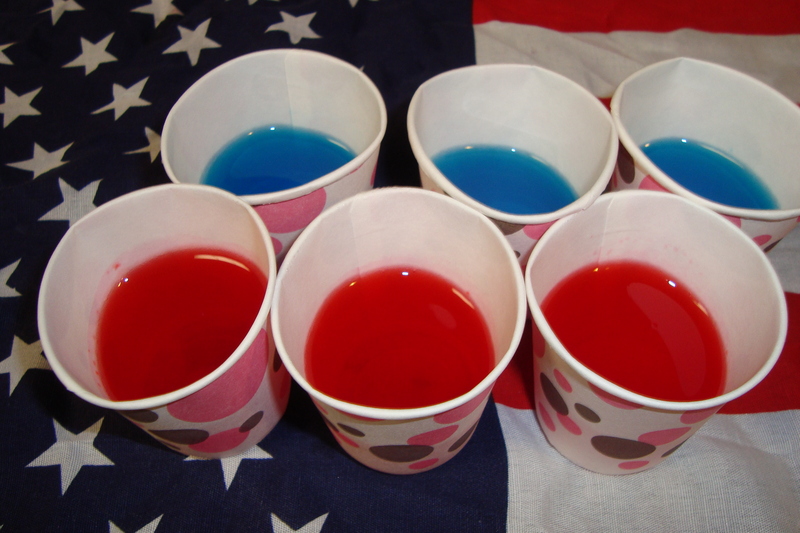 Instead, in honor of our great nation’s birthday, I’ve made red and blue JELL-O shots. JELL-O shots are really easy to make, although you do need to think a few hours ahead so that they will have time to set. I use the 3 oz dixie cups, and fill them about halfway with JELL-O mixture. If you fill them too full they become too large to take as a shot, and you don’t want people choking on your festive adult beverages! One 3 oz package of JELL-O makes 12 shots with this recipe. Heat the water in the microwave for one minute. Add JELL-O powder, stir until dissolved. Add vodka, stir, and pour into cups. 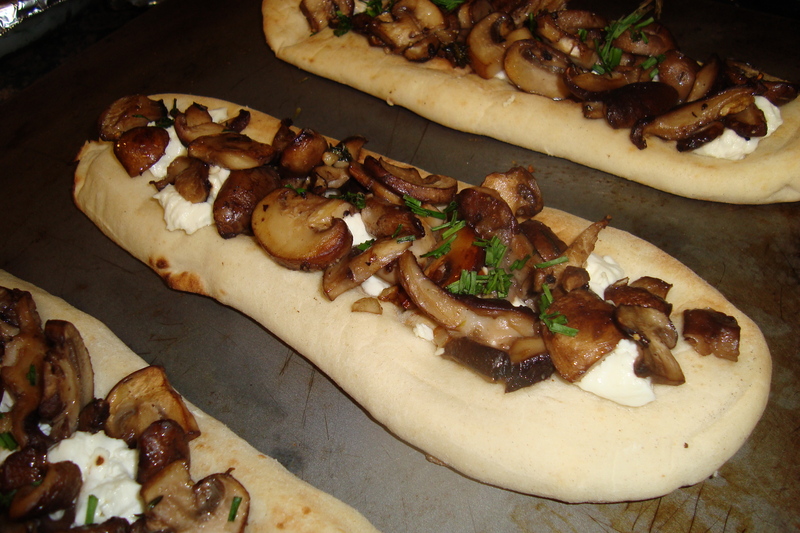 Refrigerate until set (four or more hours). 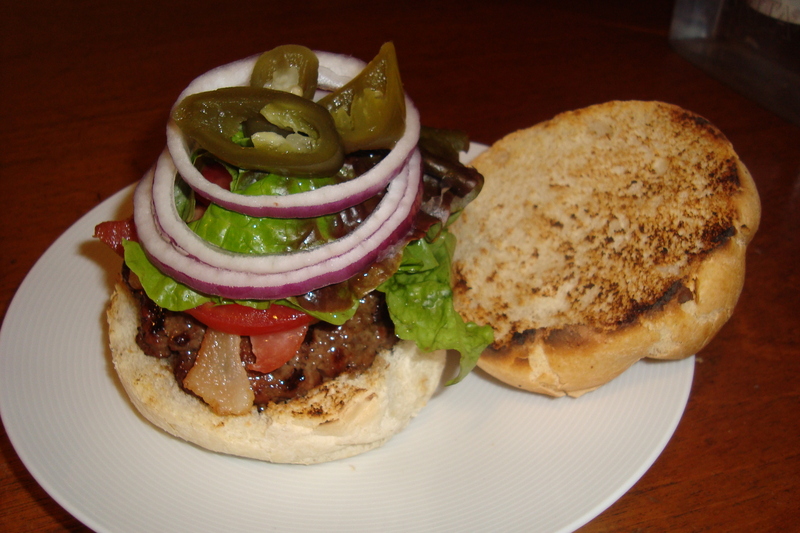 I love a good hamburger as much as anyone, but restaurant-sized burgers are usually too big for me. When did the standard burger become 8 oz of beef plus whatever other miscellaneous deliciousness you want to add? (For me that probably means chili and cheddar or sautéed mushrooms, onions, and Swiss.) I still eat burgers at restaurants, but I very rarely eat them with my hands, because they’re just too big to pick up and take bites of. 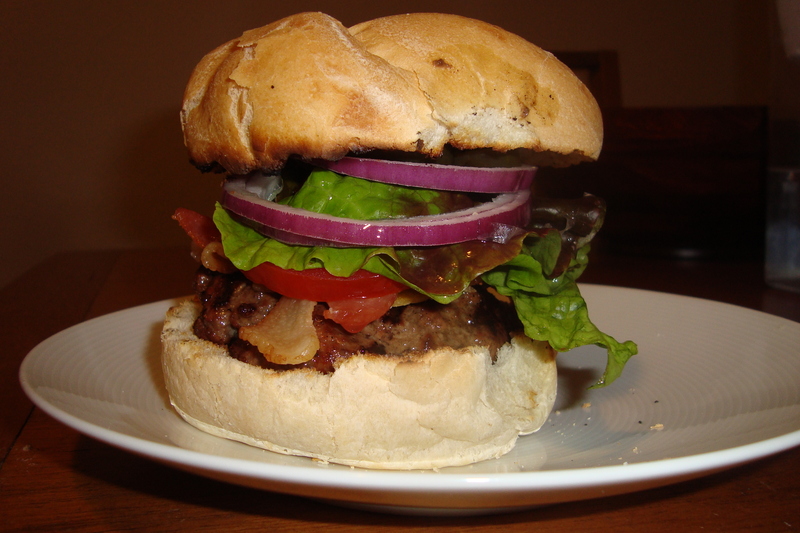 At home, however, I can make a smaller burger and still eat it with my hands. I think 1/3 lb is the perfect size, on a nice, toasted or grilled kaiser roll. Kaiser rolls are light enough to squish down for easier eating. We set out a bunch of different toppings, then customize the burgers accordingly. I try not to go overboard with the toppings, so that my burger stays a manageable size. However, if you have guests over, they can go as overboard as they want! 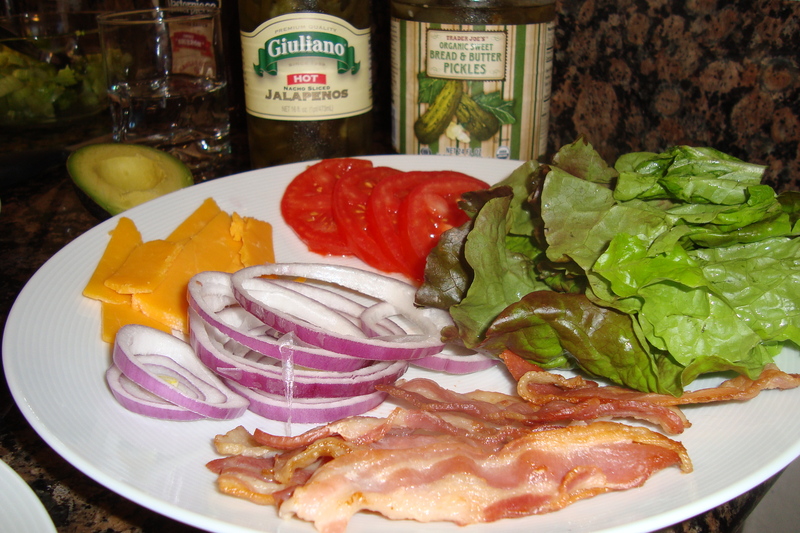 I topped mine with cheddar, bacon, tomato, lettuce, red onions, bbq sauce, pickled jalapenos, and pickles. 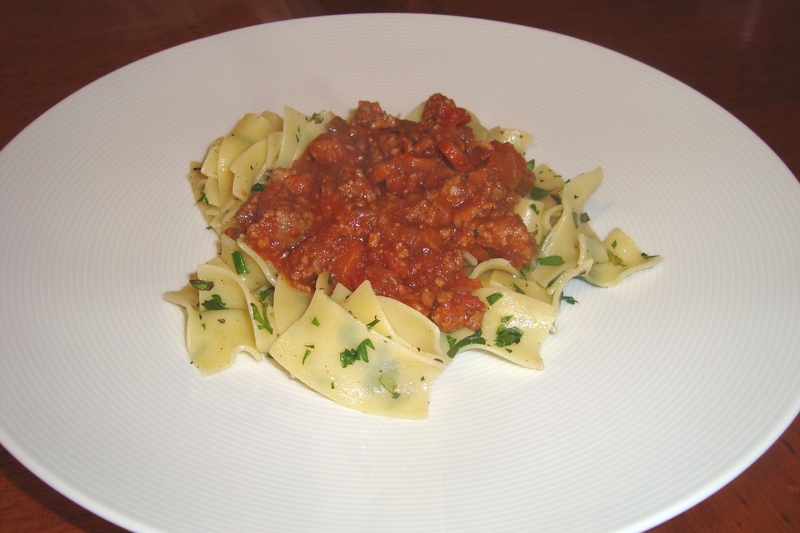 On Saturday, I tried to think of something that would be easy to make for a group but special enough for company, and after flipping through several cookbooks for inspiration, I decided on a pork ragu. I used a mixture of ground pork and sausage because I was pressed for time (it still took 2 1/2 hours), but if you have 4 hours or so, you could make this with pork shoulder. The long simmering time is what allows it to really develop its flavor, so try not to take too many shortcuts! Heat a large dutch oven over medium high heat. Coat the bottom of the pot with olive oil. When the oil is hot, add the onions, carrots, garlic, and celery, and stir to coat with oil. Season with salt. Allow the vegetables to really brown, then stir and allow to brown again. Repeat 2-3 times. Add the tomato paste the the pot and stir to coat the vegetables in tomato paste. Allow the tomato paste to brown for 2-3 minutes, stirring frequently to prevent it from burning. Add the wine, stir, and allow to reduce by half. 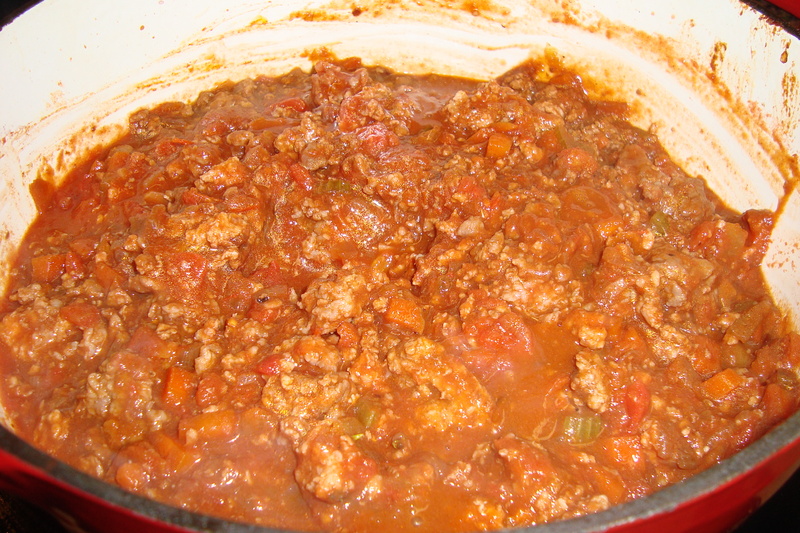 Add the can of crushed tomatoes, then fill the can halfway with water, and pour into the pot. (This helps you to include any remaining tomato from the can in your sauce.) Add the paprika, thyme, and bay leaf. Stir, taste, and add additional salt if necessary. Bring to a simmer, cover, and simmer for 1 1/2 – 3 hours, depending how much time you have. Every 15 minutes, stir, taste, and add water if necessary. Season again if desired. Server with parmesan over plain spaghetti, or make buttered egg noodles with herbs (see below). I highly recommend the egg noodle option! Prepare the egg noodles according to the directions on the package. Remove from the pot and drain. Add the butter and oil to the empty still-hot pot. The residual heat will melt the butter. Add the drained noodles back to the pot and toss. Season with salt and pepper, then toss with parsley, chives, and basil. 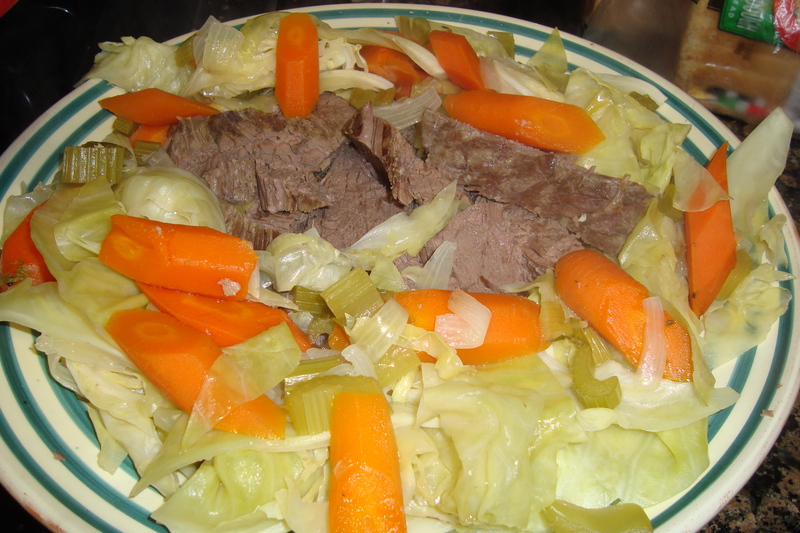 Corned beef and cabbage for St. Patrick’s Day! Inspired by a rainy weekend and my friend Amara, I decided to make corned beef hash and cabbage for a festive St. Patrick’s Day meal. Although I did not think of it in time to brine a fresh brisket, a store-bought corned beef did the trick. Rinse the corned beef thoroughly to remove the brine. Place the meat in a large dutch oven, then add the mustard, bay leaf, salt, pepper, and thyme to the pot. Add enough cold water to the pot to just cover the meat. Bring the water to a simmer and simmer, covered, for 3 hours. 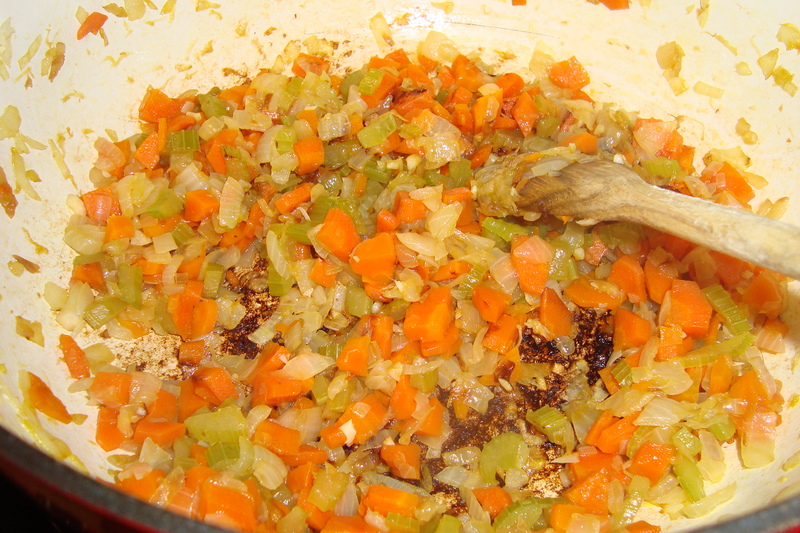 Add the onion, carrots, and celery to the pot and return to a simmer. (If you are adding diced potatoes, you can add them here as well.) Simmer uncovered for 15 minutes. Add the cabbage wedges to the pot and allow to cook for an additional 20-30 minutes, until the cabbage is tender. When the meat it tender, remove it from the pot and allow to rest for 10 minutes. Remove the excess fat from the meat and cut into thick slices. Arrange on a platter surrounded by the cooking liquid and vegetables. If you did not include the potatoes, serve with mashed, roasted, or boiled potatoes, and spicy mustard on the side.